Say cheese! – Hay Hay It’s Donna Day #10! 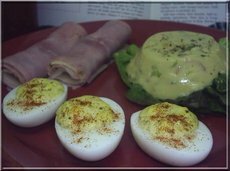 To think I was worried that no one was going to take part in this edition of Weekend Cookbook Challenge! I love it when the blog world proves me wrong. We had a big bunch of entries into the WCC this go-round! 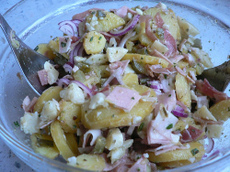 Thanks to everyone that took part – there are some really inventive and interesting salad recipes! The info for the NEXT WCC – #15 – is posted at the bottom of the roundup. Asha from Aroma gets us started on a spicy note with her Caribbean Salad from Hotter Than Hell by Jane Butel. Emmy from Vegan Diva (what a great blog name!) 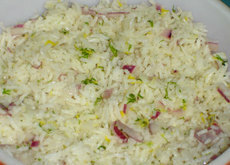 sends in a Rice Salad with Lemon, Dill, and Red Onion courtesy of Martha Stewart’s Martha Stewart Living Annual Recipes 2003. 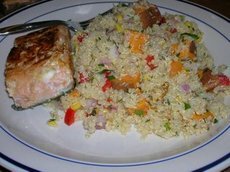 Lis, who blogs at the beautiful La Mia Cucina, shares a sweet family recipe with a Fresh Fish Salad created by her father! 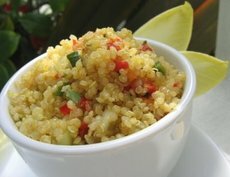 Jenny over at All Things Edible breaks all the rules with her Quinoa Salad, which she made the recipe for! Great minds were thinking alike! 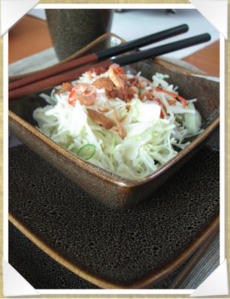 Brigitte at Kuchedunst aus Singapur also took part with a Crispy & Tangy Cabbage Salad. 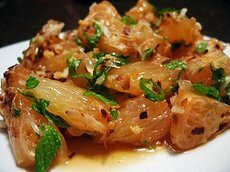 This time the recipe comes from Green Mangoes and Lemongrass by Wendy Hutton. A fellow Atlantan! 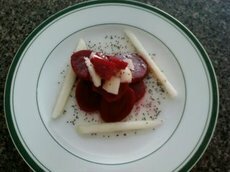 Chris from Mele Cotte shares a Beet and Pear Salad with Lemon Poppy Seed Dressing, the recipe for which came (loosely) from The Joy of Cooking. Michelle at Je Mange La Ville shares a recipe from a cookbook that’s near and dear to my heart – Donna Hay’s Modern Classics #1. 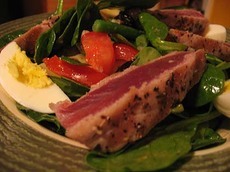 Her contribution to WCC is a delicious version of Salade Nicoise. This is neither a recipe specifically posted for WCC…nor is it from a cookbook (you rule breaking heathens! 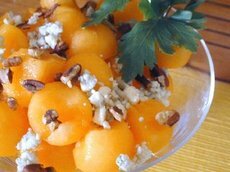 )…but the flavor combination of Doodles’ Cantaloupe Salad at Peanut Butter Etouffee was too good to not post! Another fellow Georgian, Lynne over at Cafe Lynnylu, takes part with her red-hot Couscous and Chile Salad, courtesy of Red Hot! A Cook’s Encyclopedia of Fire and Spice. Breadchick from The Sour Dough shows off a delicious composed salad: New England Scallop Salad, which was adapted from the Harvey House Cookbook. 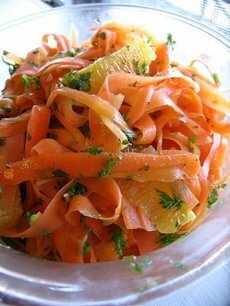 Brilynn, who blogs over at Jumbo Empanadas, decided you win more friends with bacon than with salad, especially this Carrot Ribbon Salad from Happy in the Kitchen by Michel Richard. For the record, I couldn’t agree with you more, Brilynn. Does this look familiar? You’re not seeing double – two people made the same recipe. 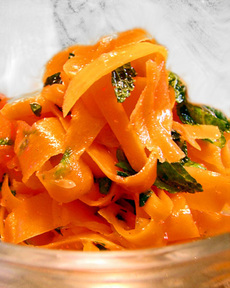 Renata from Little Bouffe seemed way more excited about her Carrot Ribbon Salad with Spices and Citrus, also from Happy In The Kitchen by Michel Richard. 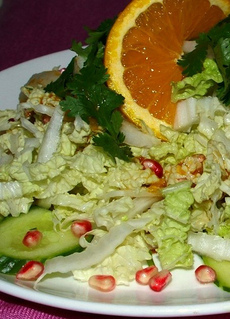 Claire from Cooking is Medicine does the unthinkable…she used soup as salad dressing! Neat-o! 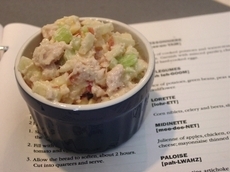 Her contribution to WCC is Polynesian Chicken Salad from the Mitford Cookbook by Jan Karon. 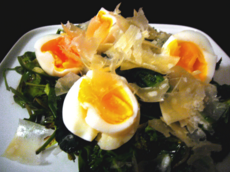 Our gracious host for the next WCC, Marta at An Italian in the US, shares her recipe for Insalata Capricciosa from Cucina di Tradizione del Piemonte No. 2. Whew! Anything called "Cheese Salad" can’t be bad right? 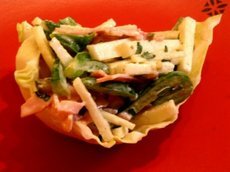 Ulrike, who blogs over at Kuchenlatein, shows of her Insalata di Fontina, from Kochen mit Kase…or…Cooking With Cheese! Yes, please! 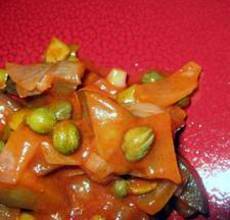 Another Donna Hay recipe! 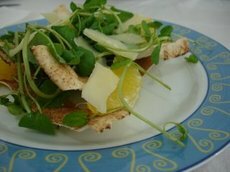 Patricia from Technicolor Kitchen shows of layers of textures and flavors with her Watercress and Parmesan Flatbread Salad from Donna Hay’s Entertaining. 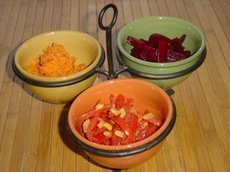 Showing off great use of color and texture in her salad, Glenna at A Fridge Full of Food shares her Patchwork Slaw, the recipe for which comes from The Dairy House Hollow Soup & Bread Cookbook by Crescent Dragonwagon. Laura from her eponymously named blog Laura Rebecca’s Kitchen snubs the fancy cookbooks in her collection for a black binder full of solid recipes and shares one for Midinette. 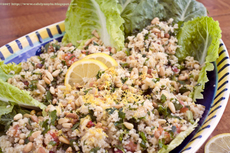 It’s nice to see so many grain-based salads! First-timer Emily at Superspark (what a pretty blog, Emily!) 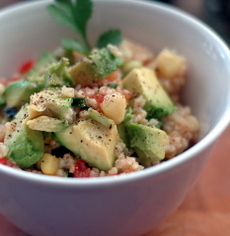 takes part with her Millet Salad Mexicano from The Modern Vegetarian Kitchen by Peter Berley. 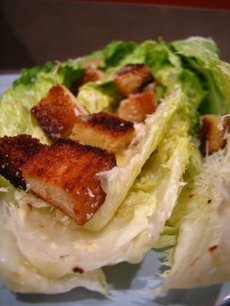 Finally…a Caesar Salad! 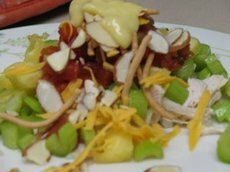 Katie from Little Spatula breaks out her copy of Emeril’s Kitchen and shares the recipe for this salad classic. 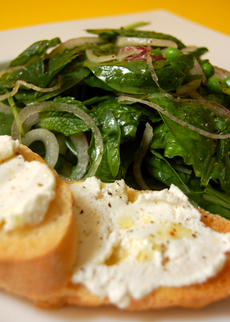 Haalo from the gorgeous blog Cook (almost) Anything At Least Once shows off a lush, green healthy Salad of Spinach, Peas and Mint with Goat Cheese Crostini from Classic E’cco by Phillip Johnson. 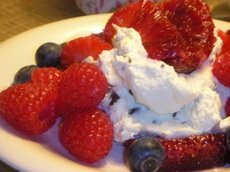 Puu from Puu’s Cookbook shares a lovely and yummy sounding Fruit Salad with Cannoli Cream recipe from Everyday Italian by Giada DeLaurentis. To say that Ian from The Gallumphing Gourmande is kicking it old school style would be an understatement. We’ll let his Confetti Relish Mold, taken from Better Homes & Gardens: Lunches and Brunches circa 1963, speak for itself. I’m giving Ian a gold star for this one: not only for the courage to eat a savory mold salad…but this really embodies the spirit of Weekend Cookbook Challenge! 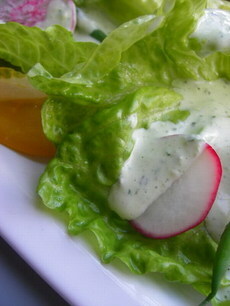 Lastly, there’s little ol’ me at Running With Tweezers with my Bibb Salad with Basil Green Goddess Salad Dressing, which I am *still* eating every day – I even went back to the store for more radishes to dip into it. 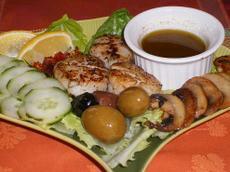 The recipe is courtesy of The Barefoot Contessa at Home by Ina Garten. Our next guest host for WCC #15 is Marta from An Italian in the US. She has chosen "Springtime/Easter" foods as her theme – this should be a good one & open to lots of interpretation! The deadline to submit your entries, which you can email to her here, is April 9th. Remember…the only catch is you have to use a cookbook or periodical in your collection as inspiration for your recipe. Good luck! This is a fabulous round up! I am excited to go through each salad. 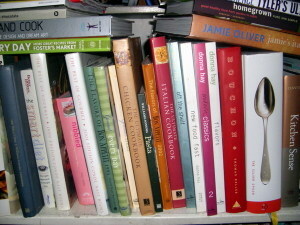 I have a feeling my cookbook collection is going to increase to obscene & mammoth proportions in the near future. 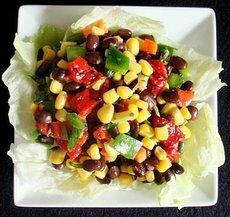 Thanks for hosting this month’s roundup :) Wow, what a gorgeous selection of salads everyone submitted! Can’t wait to check out everyone’s posts. Tami, I must say, your idea of proposing salads as theme was just great! 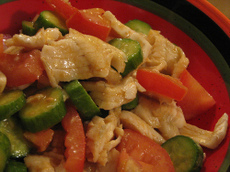 I’m so impressed by the number of delicious salads to try, now!!! I’m looking forward to hosting the new event :) – I just posted a little more detailed description of why I chose Easter and springtime food as theme. Thanks for the link and for your wonderful roundup! Great round up, Tami! This is probably one of my favorite WCC’s because I’m always on the hunt for new ways to make salad. Tami, super round up! Thanks so much for hosting WCC this month, and thanks to everyone who took part! That’s so funny two people made the same salad! Out of all the cookbooks in the world! Everything looks so wonderful. I’m sorry I couldn’t get my act together to submit something. Thanks for sharing and hosting – great job! 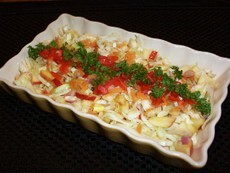 ooops………miss heathen here….but I must say this dish is in my Cookbook! thanks mucho!